Nearly half the country thinks the federal government should allow Colorado and Washington to move forward with marijuana legalization, according to a new survey. The results highlight growing support for – or at least tolerance of – cannabis legalization in the US and could help pressure the Obama administration to respect the new laws. The government still has not provided an official response to legalization, leaving state officials, the MMJ industry and cannabis entrepreneurs in the dark. Washington State’s law is set to go into effect Thursday, while Colorado’s will be implemented in the next few weeks. The government could look to block the new laws entirely or challenge provisions that call for retail sales. Alternatively, it could work with states to implement the laws in a responsible, measured way. That seems to be the preferred strategy for a majority of Americans. 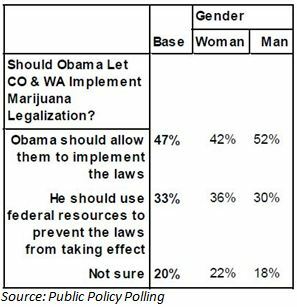 The Public Polic y Polling (PPP) survey of 1,325 registered voters, taken between Nov. 30 and Dec. 2, found that 47% of Americans think the president should allow Colorado and Washington to implement their legalization measures. Just 33% believe the government should use federal resources to block the laws, while 20% said they are not sure how the Obama administration should respond. At the same time, 58% of respondents said they think marijuana should be legal vs. 39% who hold the opposite view. That’s a different picture than the one presented by a recent CBS poll, which found support for and opposition to legalization at an identical 47%. Still, that poll – taken in mid-November – showed growing support for legalization in general over the past year. It also found that a whopping 83% of Americans back the idea of medical marijuana. The evidence is quickly mounting – be it through polls or election results – that Americans are much less concerned with medical marijuana and cannabis in general than they once were. At some point, the government will have no choice but to listen. This entire article is based on the misnomer that the federal government somehow has control over the states, well they don’t. States have the right to nullify anything that doesn’t jive with the state constitution, including marijuana laws and most recently, the healthcare laws of Obama. Obama is NOT the supreme ruler of this or any other land. Craig, You’re wrong! State law can be More restrictive than federal law but Not less. Meaning state law cannot circumvent federal law. Therefore if there is a federal law that says something is “illegal” no state law can say that it is….legally. Federal law always supersedes state law. Take it from a retired federal agent with 30 years experience. Marijuana was made illegal 75 years ago through a combination of Greed, Big business, politics and even a little racism thrown in when the Government passed the Hemp Act of 1937. Unfortunately, it will probably take the same thing to “Re-legalize” it. For what it’s worth the U.S. government has had a patent on marijuana for the past 10 years. Go figure? Marijuana has Never met the criteria for a Scheduled I drug.